شانشینی جۆسۆن یان جۆسیۆن، جۆسان، چوسان، چۆسۆن، چۆسون (بە ھانگۆل: 대조선국؛ بە ھانجا: 大朝鮮國)، شانشینێکی کۆری بوو لەلایەن ئی سۆنگگێ دامەزرا، کە بەردەوام بوو بۆ ماوەی پێنج سەدە لە تەممووزی ١٣٩٢ی زایینی تا تشرینی یەکەمی ١٨٩٧ی زایینی. بە فەرمی ناونرا بە ئیمپراتۆریەتیی کۆری. جۆسۆن لەلایەن پاشا تایجۆ و جیۆنگ دۆ جیۆنەوە دامەزرا. ^ Kim، Djun Kil (May 30, 2014). The History of Korea. ABC-CLIO. پەڕە 125. لە ڕێکەوتی April 21, 2015 ھێنراوە. 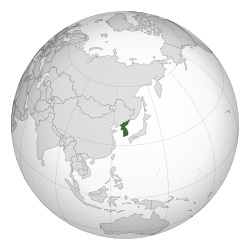 بەدواداچوون بۆ ڕێکەوت بکە لە: |access-date= (یارمەتی) "In theory Korea is a tributary, but in practice it is an independent monarchy." ^ Han، Jong-woo (December 4, 2013). Understanding North Korea: Indigenous Perspectives. Lexington Books. پەڕە 2. لە ڕێکەوتی April 21, 2015 ھێنراوە. بەدواداچوون بۆ ڕێکەوت بکە لە: |access-date= (یارمەتی) "Throughout the Goryeo and Joseon dynasties, independent statehood and unique culture were maintained"
^ Han، Kyonghee؛ Downey، Gary (April 1, 2013). Engineers for Korea. Morgan & Claypool Publishers. پەڕە 16. لە ڕێکەوتی April 21, 2015 ھێنراوە. بەدواداچوون بۆ ڕێکەوت بکە لە: |access-date= (یارمەتی) "Joseon would rule the peninsula for 500 years. Although technically independent of the Chinese empire, Joseon also accepted subordination as a tributary"
^ Zhao 2003 ، پ. 99، لە پەرتووکەکانی گووگڵ; excerpt, "Historically, China and Korea shared complex and intimate relations, which were symbolized by a hierarchical tributary system. As Chae-Jin Lee points out, ‘Korea’s tributary relations with China began as early as the fifth century, were regularized during the Goryeo dynasty (918–1392), and became fully institutionalized during the Yi dynasty (1392–1910)'." ^ Nahm 1988, p. 94: "Two most significant aspects of Korean history of the early Yi period were the establishment of China's suzerain lordship over Korea and confucianization of the country. Immediately after Yi Sŏng-gye established his dynasty, he sought the approval of the Ming court of China for actions which he had taken, seeking the legitimacy of his own dynasty. But it was one of his sons, T'aejong ... who received the recognition of the Ming court for the new kingdom and its ruling dynasty. With this, Ming China assumed suzerainty over Korea and the Yi dynasty pledged its loyalty to China as her vassal, establishing the Sino-Korean relations based on the principle of sadae ("subservience to big power")". p. 95: "With the establishment of the lord-vassal relationship with China and the adoption of Neo-Confucianism as its state creed, the Yi dynasty brought about a thorough Confucianization of Korea's politics and political structure, social thoughts and institutions, as well as its economic, intellectual, and cultural patterns." ^ Schmid, Andre. (2007) "Tributary relations and the Qing-Chosǒn frontier on Mount Paektu." In Diana Lary (ed. ), The Chinese State at the Borders, 126-150. Vancouver: UBC Press, ، پ. 127، لە پەرتووکەکانی گووگڵ: "Chosǒn, a dynasty that had been conquered and coerced into tributary status under the Qing." Also, p. 129: "Korea during the Chosǒn dynasty, more than any other country, gained a reputation as the pre-eminent tributary . . . the Chosǒn court’s dispatch of missions to Beijing—on average more than four times a year and occasionally so frequent as to become an irritant to their less than welcoming hosts—affirmed the centrality of Beijing." ^ Hatada, Smith Jr & Hazard 1969, p.97: "Korea had sent troops into Manchuria as ordered by the Ming [fn.5]". p.97, fn.5: "In the suzerain–vassal relationships of the Chinese system of international relations, one of the duties of a tributary state was to assist its suzerain in military campaigns when requested. Korea was a tributary of the Ming at that time." p.80: "Korea yielded and . . . agreed to break relations with China, to turn over certain princes and high ministers as hostages, to observe suzerain-vassal relations toward the Manchu Ch'ing, and even to send reinforcements to the Ch'ing forces for their attacks on the Ming emperor. However, even after this, Korea's regard for China was strong; she secretly continued her relations with the Ming emperor, used Ming reign titles even after the fall of Ming [fn.6]". p.80, fn.6: "Ordinarily a tributary state in the Chinese system of international relations used for dating the reign titles of the state to whom it paid tribute. Korea, having at that time become a tributary of the Ch'ing dynasty, should have disregarded Ming reign titles, and especially so after the fall of the Ming in 1644." ^ 권태환 신용하 (1977). 조선왕조시대 인구추정에 관한 일시론. ^ a b c d 이헌창 (1999). 한국경제통사 52쪽. ئەم پەڕەیە دواجار لە ‏١٨:٣٥ی ‏١٢ی ئازاری ٢٠١٩ نوێ کراوەتەوە.